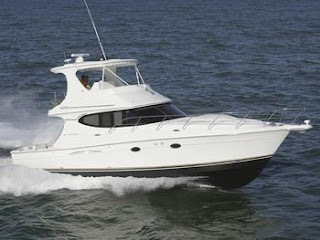 Hi my husband and I just sold our fountain race boat and purchased a 45 silverton. we have two girls nicole and danielle and can not think of a cool name that is also not girly. The Silverton is beautiful (photo courtesy of FirstBoat.com) and certainly more practical (as far as boats go) given that you have a family. However, there is probably an opportunity here for a boat name that describes your before-and-after experience, which is very dramatic -- going from such a performance-oriented boat to the motor yacht. Must feel like your lumbering along in that big ol' thing. Maybe something like, Tortoise and Hare, or Knot So Fast. If you plan to fish off the Silverton, how about "The Reel Race"? How about naming it "Just 4 Fun" ? Another idea would be "The Dannico", (a combination of your two daughters names - Danielle & Nicole).